The card I'm posting now will be good to add to two different challenges. The first one is Simon Says Monday challenge, this weeks theme is I should really use this more. With that in mind I decided to pull out my Perfect Pearls. I don't use them often enough and I love the color and shimmer they leave behind. 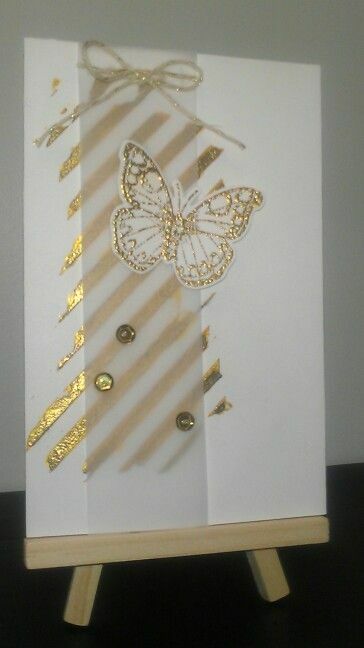 I used heirloom gold and cappuccino Perfect pearls on the wood grain for the tag. 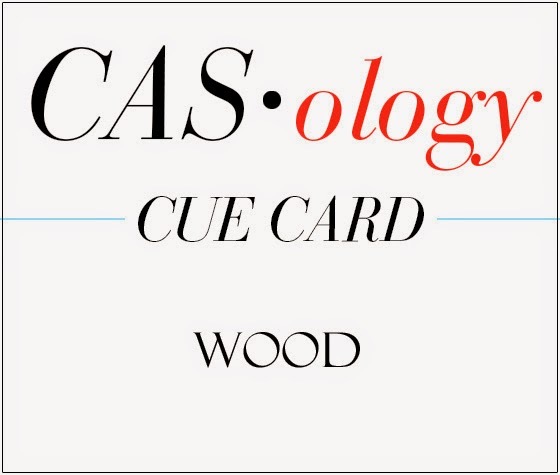 The other challenge this will work for is CASology, the cue wood on their blog is Wood. 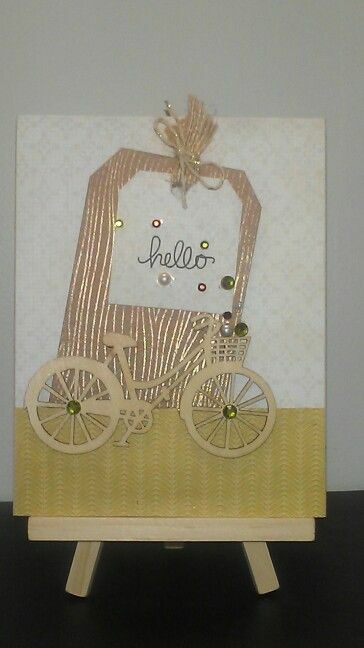 So in addition to the wood grain tag, I've also used a wood veneer bicycle that I received in a card kit awhile back. 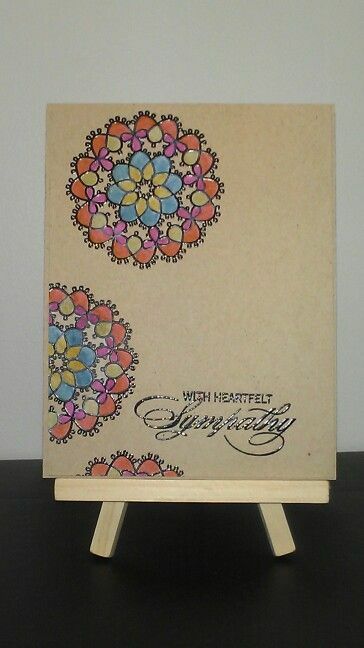 I finished off the card with some pearls and gems scattering out of the basket for fun and called it a day. 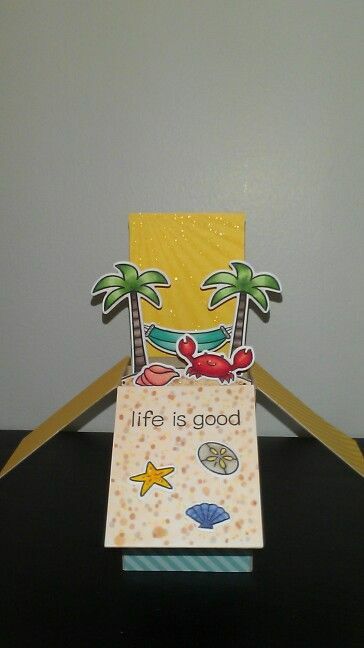 This card I made today is getting linked up with Create a Smile stamps. 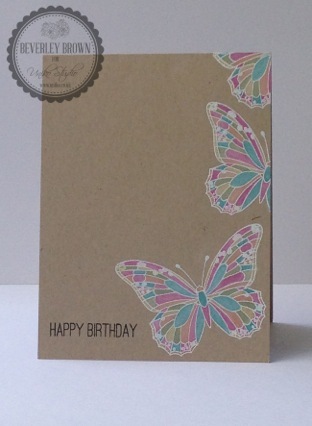 They are a very new stamp company and looking for a guest DT member for their very first release! How exciting is that!!! They have released a few free digi images on their facebook page. You can check them out here. So on to my card. 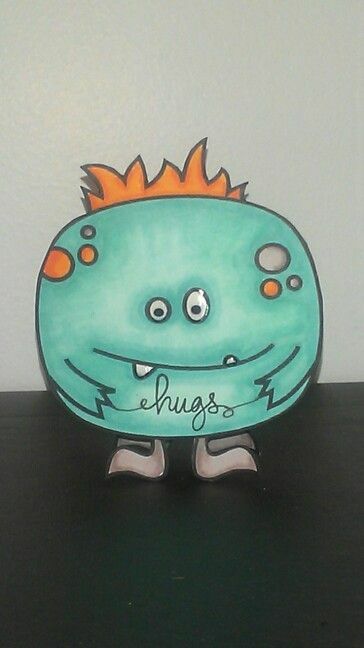 I love this little monster that Christine drew, she's got talent! Since he's a digi, I enlarged him a little and fussy cut 2. After coloring, adding the sentiment and putting glossy accents on his eyes and teeth, I glued his hair and just a bit under the hairline. 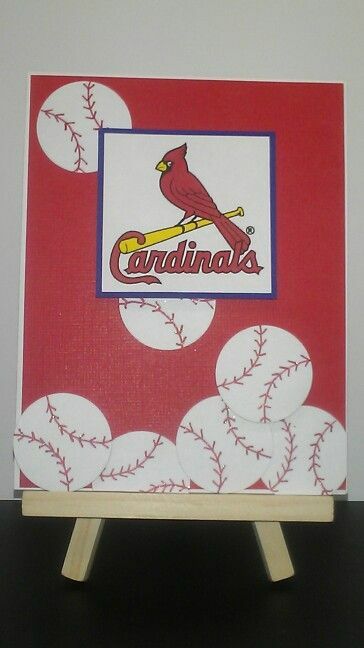 So that he is a top folding card about 3 1/2 inches tall. I can't wait to see what else she comes up with and I'm super excited about the first release. Best of luck to you and your company, Christine! Just a little update since this card was featured in Lawnscaping blogs Spotted and Hearted! Today I'm posting with my first ever entry into the Muse Challenge. I wanted to participate with the last one but just didn't get my stuff together in time. Doh! Love the look of this card, and she used a technique that I've wanted to try. My card didn't differ much from the Beverley's card, since I wanted to try and create a stained glass effect too. I got an inspired idea tonight after looking around online. So I sat at the craft table and got busy. 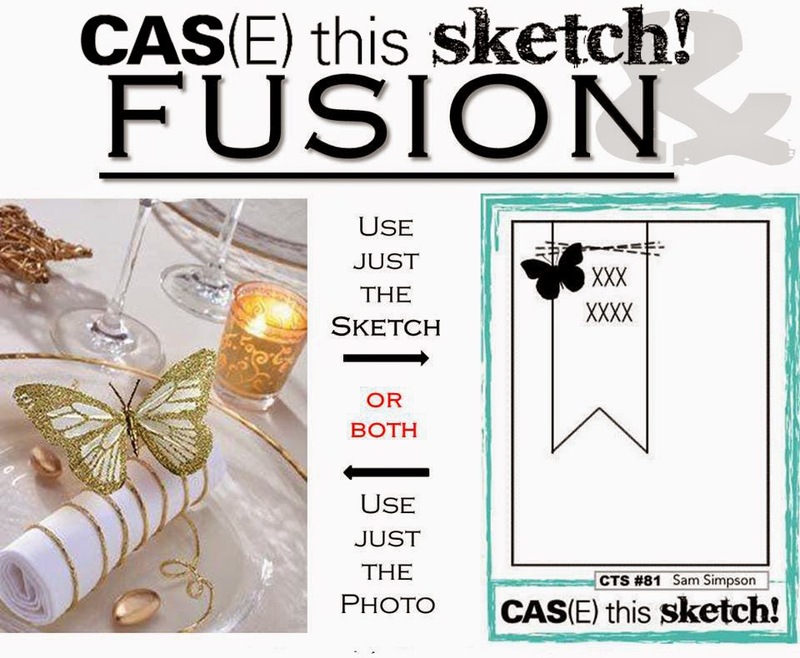 I got the layout from CAS(E) this Sketch who have teamed up with Fusion Card Challenge, I have not played along with either of the challenges before. I loved the look of the gold and white so I stuck with that color combo. Even though gold isn't a color I use often I thought the turn out was nice. 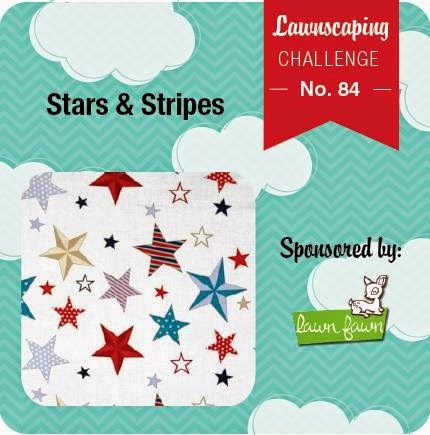 I thought this would make a great addition the the current Lawnscaping Challenge as well. I'm of to bed since I have to get to work in the morning! (Gotta love retail!) ;-) Hope everyone is having a wonderful weekend! 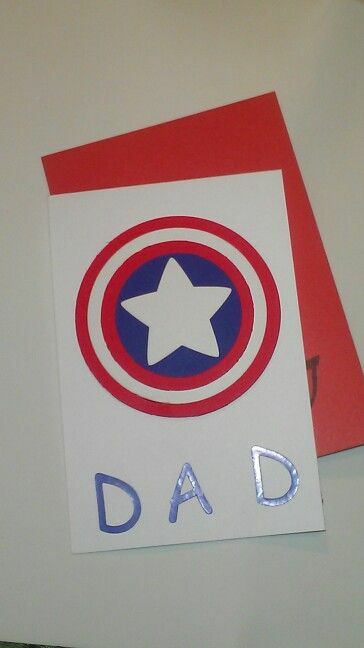 The card I made today is very patriotic. I had 2 challenges is mind when creating the card. I'm going to link this card up to the Simons Says Stamp Wednesday challenge and the Lawnscapping Challenge. 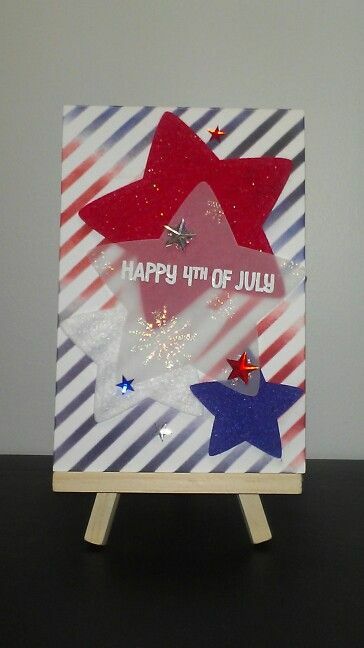 I used a Heidi Swapp stencil for the stripe background and colored it using Distress Inks ( Chipped Sapphire and Fired Brick) I used the Puffy Star dies from Lawn Fawn to cut out the vellum and felt stars. 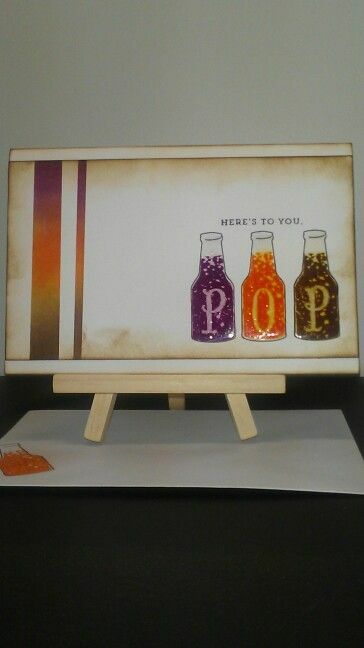 Stamped the sentiment and fireworks ( Lawn Fawn) and embossed them in white and iridescent glitter. Added a few star gems to finish up ( and to hide the glue spots on the vellum). Can't believe it's the middle of June already, which means Father's day is Sunday! I got my cards made so i thought I'd share them with everyone. I'm also linking one of them up with the Lawnscaping challenge. I water colored the background in different shades of blue . Used a decorative edge punch for the waves on the vellum. Layered my boat between them. Die cut the sun, added a few birds and embossed a couple of clouds and sentiment. ( The clouds are actually meant to be bushes, but ever since I first saw the image I saw a cloud) :) I didn't like the way the edges were looking with the watercolor paper and vellum so I decided to add some thick twine around the image to finish it off. 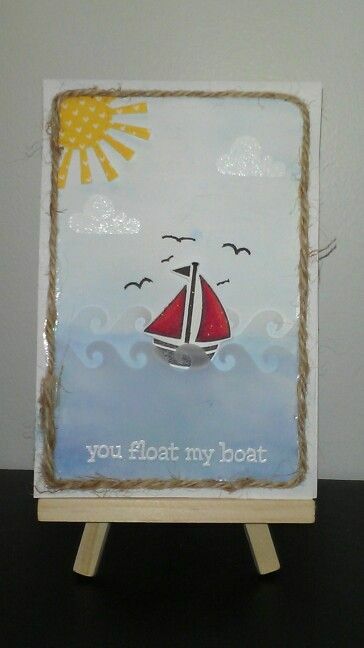 Misc: Wave border punch, vellum paper, white cardstock, watercolor paper, thick twine. I had seen someone from the Lawn Fawn DT make a shield and thought Alex would like to make one too! Daddy will love it! Thanks for stopping by and a Happy Father's Day to all the dads out there!!! I wanted to post this card earlier since it was finished, but made myself wait until I know that my grandma received it first. Didn't want to take the chance that she would see it online first, wouldn't want to ruin the surprise of seeing in person first. I was just going to go for the inlay technique with the blue and yellow feathers, but decided to add the original feather cut out at the last minute. Having 3 looked better to me than just the 2. I used some paper from a 6x6 MME pack and die cut them using the Feathers from My Favorite Things. I distressed the edges using Pumice Stone and stamped the sentiment in Memento Luxe Rich Cocoa. The sentiment is from Simon Says Stamp. 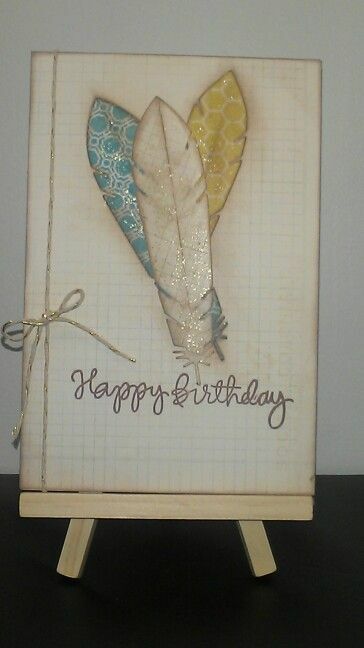 To finish it off added some Old paper distress stickles to the feathers and added some twine from Lawn Fawn. You can't really tell from the photo but the top feathers sides are slightly popped up.